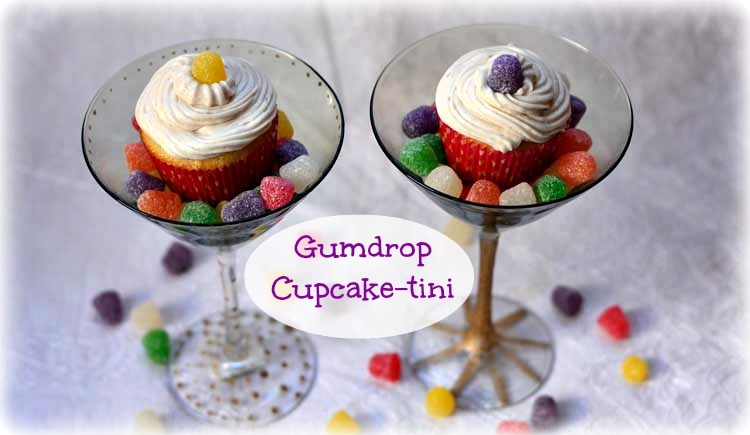 Gumdrop cupcake-tini is a fun way to serve cupcakes for New Year's Eve or any celebration. These cupcakes are made entirely with supplies from the Dollar Tree making this not only cute, but affordable. 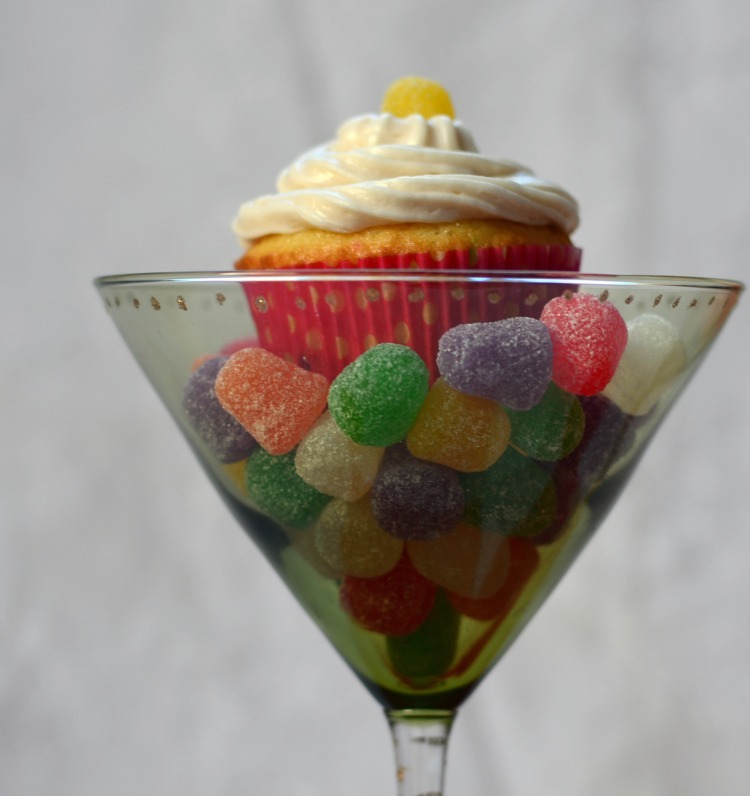 I had never heard of a cupcake-tini until just a few weeks when the Dollar Tree asked me to check out the Dollar Tree Value Seekers Club. The club is full of crafts, recipes, décor, tips, contests, insider information, frugal fun ideas, and more! Membership is Free and the content changes each month. Plus, the project sheets can be saved or printed – perfect for taking to the store as a shopping list. When I saw these New Year's Eve Cupcaketinis I had to make them! They are adorable. You can check out the Dollar Tree version, with instructions here. Candy – I used gumdrops, but be creative! This is the coolest thing about this project – you use nail polish to pretty up your glasses! It totally worked and is just really fun. The Dollar Tree directions called for clear nail polish and craft glitter, but I figured I'd skip a step and just got glitter nail polish. 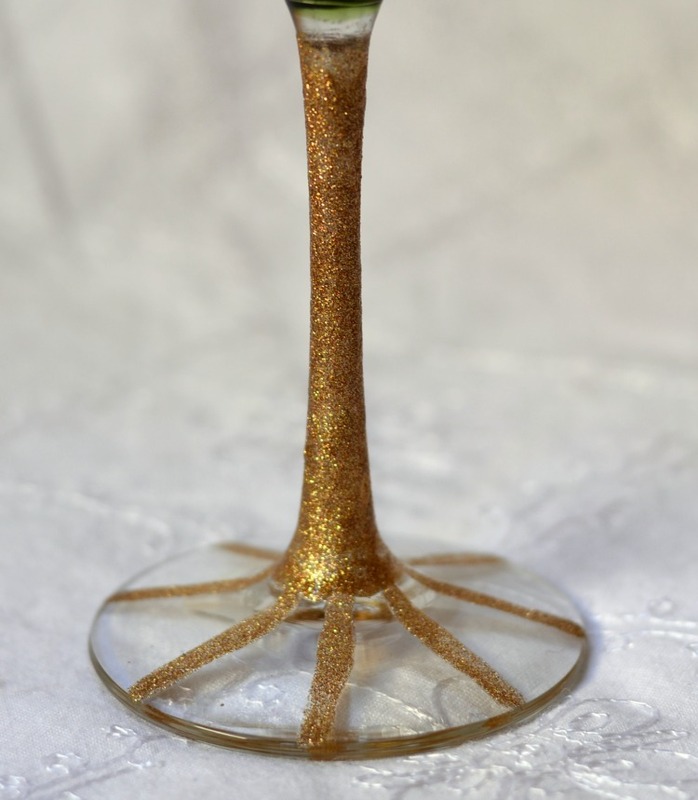 On the first glass, I painted the stem solid with the nail polish. 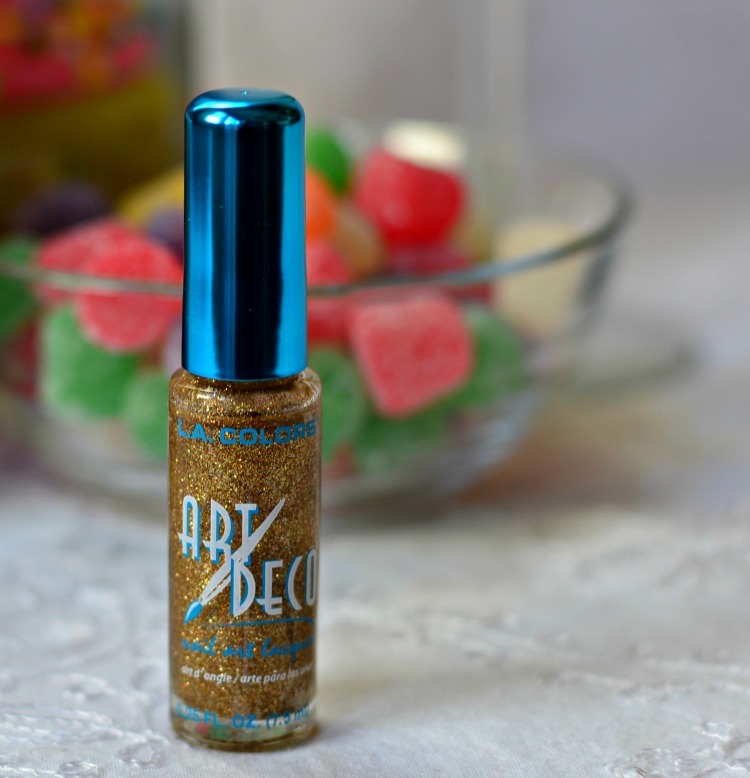 It took 5-6 coats to get a solid glitter look. I waited for each coat to dry, but it only took a few minutes to dry completely. I added a little star burst to the base of the glass. 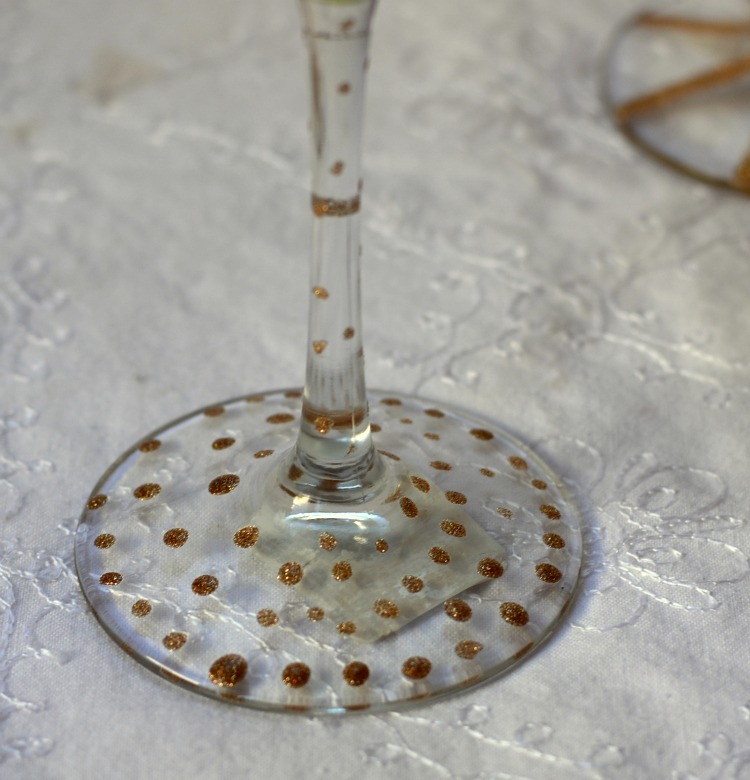 On the second glass, I went with polka dots on the base and up the stem of the glass. Just be careful not to load too much nail polish on the brush so it doesn't drip or glop. If you want to give these to guests to take home, a name or initials would be fun. 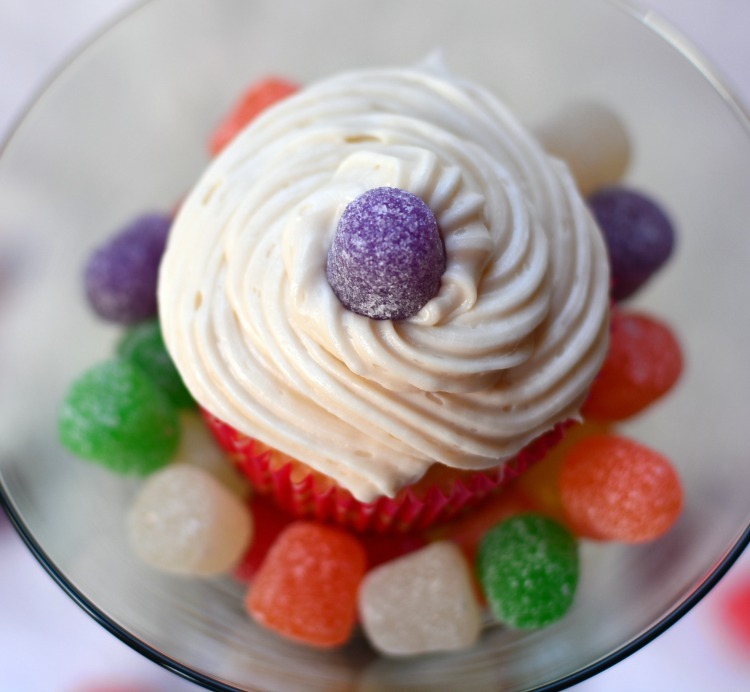 I used a confetti cupcake mix because it seemed fitting for a New Year's Eve celebration. The Dollar Tree cupcaketinis used Sno-Cap candies for the cupcaketinis, but I wanted something with more color. I found bags of gum drops in the candy aisle at the Dollar Tree and I love how they turned out. I love how these cupcaketinis turned out and will definitely be checking out the Dollar Tree Value Seekers Club often for creative inspiration. Love this! I can’t wait to share it with my grandchildren. We want to do the new years photo booth idea and the snowcap snowmen for out winter party. Good Luck everyone. I would love to make the Christmas tree snow globes. I would make the Santa and Elf Silverware Sleeves first. Bottle Cap Snowman Ornaments would be a lot of fun! I really hope I win this! I could do SO much with a DT gift card. I love that store. And the Cupcaketinis are so cute and clever. Great job! I would love to try the Homemade Snow globes. The white chocolate peppermint pretzels look really good. Thanks for having this contest. I like the Baby bottle shower favors. I am going to try the White Chocolate Peppermint Pretzels recipe…yummy! 🙂 Thank you. The hand painted serve wear sounded interesting. I like quick projects. I want to try the New Years Eve Photobooth craft first! I like the bottlecap snowman ornaments. Thank you! Oh, what fun this would be as a Christmas activity for the 21 and over kids. I want to do the 5 bite sized foods for holiday parties. I would like to try the Homemade Snow Globe project. I want to make the Bottle Cap Snowman Ornaments my three kids would have a blast with that or the snowglobes. I would like to try the White Chocolate Peppermint Pretzels. The Santa and Elf Silverware Sleeves are super cute! Homeade Snow Globes is what I’d try first. I like the Christmas countdown calendar. I’d try the Bottle Cap Snowman Ornaments with the kids, looks fun! The White Chocolate Peppermint Pretzels is what I want to try first! The homemade snow globes would be neat. I would like to try the christmas decor by Jessica H.
I want to try the Bottlecap Snowman Ornaments! They are too adorable! I would like to try the snow globes first. I would love to try the Homemade Snow Globes! My kids would love that project! I’d like to try the snow globe project. I want to try the snowflake popsicles first! I love the balloon painting idea and I think I could do it to where it wasn’t a really messy craft for my three kids. Thanks for the opportunity to win! I want to try the Homemade Snow Globes. The Gum Drop cupcake tin. I would like to make the Bottlecap Snowman Ornaments. They are so cute, and the kids can help make them. I really want to make the Fingerprint Christmas Lights Keepsake craft with my 4 kids. bottle cap snow men are cute! I would love to make the homemade snow globes. I can’t wait to try the white chocolate peppermint pretzels. I want to try to make the homemade snow globes. I’d make those White Chocolate Peppermint Pretzels – looks easy enough! The snowman bottle caps is really cute! I would love to try the Homemade Snow Globes first. They look awesome. the snowcaps and chocolate candies! The hand painted serve ware is the best! I want to try making the homemade snow globes. We will be doing the Fingerprint Christmas Lights Keepsake today! I really want to make the bottlecap snowmen! I like the New Year’s photo booth. I like the homemade snow globes. I would make them. Sprucing up the wine glasses!!! I want to try the Large Popsicle Snowflakes first. They would look great on the my wall. Balloon painting actually looks really fun to me! Thanks for the giveaway and inspirational creation. I really wanna try this one! It’s absolutely adorable, I’m already trying to come up with an excuse to do it! Balloon Painting sound like something fun to do with our son! I would like to make the Bottlecap Snowman Ornaments. I like the Christmas Countdown Calendar! Too late for this year, but maybe next year! 🙂 Super fun! 🙂 Thanks for sharing and thanks for the chance to win! I love the snow globes!!! The Bottlecap Snowmen are cute! I’d like to try the bottle cap snowman ornaments on their website. They are really cute. Thanks for the giveaway! Homemade Snow Globes! Super cute idea!! I can’t wait to make the Homemade Snow Globes with my kids. Its too late to do this year, but this would make great project to go do with my daughters class. I would like to make the bottlecap snowman ornaments with my grandson. Festive Snowman Place Setting is so cute. I want to make these cute Bottle Cap Snowman Ornaments! I really like them. We want to make Snow globes! Oh my goodness… I just clicked over to the site. I had no idea they offered so many little ideas. LOVE the bottle cap snowmen. The would be easy since we always seem to have bottle caps floating around this house. Those are an absolutely adorable way to serve cupcakes. I love the idea of making the glasses a party favor. The homemade snow globes look like fun. I would like to try the 5 Bite-Sized Foods for Holiday Parties! Great ones! I’d love to try the snowglobes with my twins! Love the Bottle cap snowman ornaments, but instead of ornaments, I would make them into fridge magnetics for gifts. Loved the snow globe! I would like to try that with my daughters! I first want to try the White Chocolate Peppermint Pretzels. In fact, I think I’ll make some this weekend. Thanks. The silverware sleeves are very cool! I like the bottlecap ornaments. I think I would like to do thing New Year’s Eve ballon Countdown! I am going to try the 5 Bite-Sized Foods for Holiday Parties!! Would love to try Fingerprint Christmas Lights Keepsake! I would love to try the white chocolate peppermint pretzels! I like the Bottlecap Snowman Ornaments project. I like the homemade snow globes project! I would love to try the snowman caps. They are so cute. I like the bottlecap snowman ornaments. The white chocolate peppermint pretzels look great to try. I want to try the homemade snow globes! I think the Christmas Countdown Calendar would be really fun to do. I would like to make the Santa and Elf Silverware Sleeves first! I would try the popsicle stick snowflakes. I like the bottle cap snowmen. If I can find some bottle caps – I WOULD LOVE to make those bottle cap snowmen!!!!! I’d try the Tree & Snow Jar! I’d like to try the New Year’s Eve Balloon Countdown first. The Christmas Décor by Jessica H.
Id really want to try out the bottle cap snowman ornaments! Santa and Elf Silverware Sleeves are super cute! I’d like to try the bottlecap snowman ornaments. I love the dollar tree for craft supplies! I will be trying the tree and snow jar. I’d like to try the large popsicle snowflakes craft. In fact, I might try to fit that in with my older kids before Christmas. I would try the popsicle stick snowflakes first. Definitely the bite-sized foods for parties. I like to pretend that it will help me with portion control. The bottle cap snowmen are so cute! 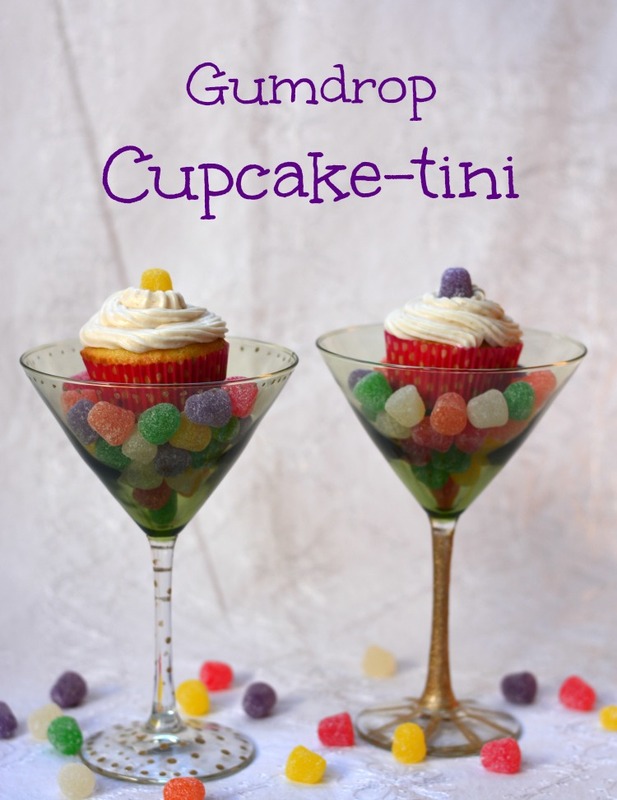 I like the cupcake-tini for holiday parties. I’m love snowmen so I would do the bottle cap snowman. 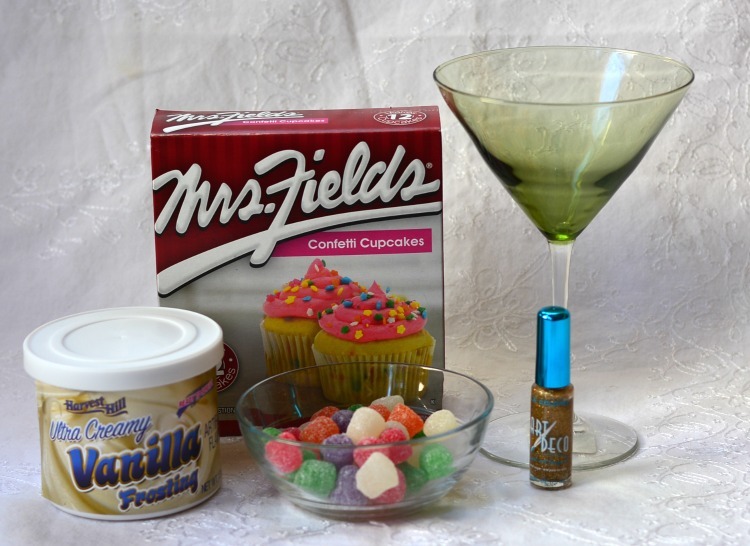 I love the Cupcaketini for New Years! How fun! Thanks for the chance to win. I love shopping at Dollar Tree. I want to try White Chocolate Peppermint Pretzels first.